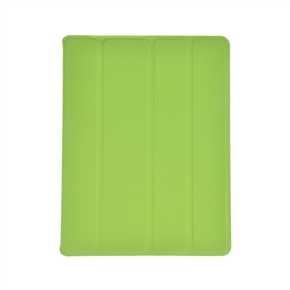 The green spider design leather cover for iPad 2 is lightweight, slim and durable and supports standby function. When you fold the cover, the iPad will automatically turn to standby mode. It can provide protection from scratches, damage and dust. It's well designed for all buttons, controls and ports to be accessible. - Spider design leather cover. - Lightweight, slim and durable. - Provide protection from scratches, damage and dust. - Completely compatible with iPad 2. - All buttons, controls and ports are fully accessible. - Accessory ONLY, iPad 2 not included. Customer Rating: 5 customers would recommend this product to their friends. Agree with them, or you have different ideas? Write your comments. Item was as described and arrived promptly. Excellent. My niece loved this as her birthday gift!!!! Thank you for the fast shipping!!! In great shape! Fast Dleivery! Thanks. The green spider design leather cover for iPad 2 is lightweight, slim and durable and supports standby function. When you fold the cover, the iPad will automatically turn to standby mode. It can provide protection from scratches, damage and dust.